After a slow start because of unusually low soil temperatures and wet conditions, corn took off and has looked beautiful across most of the state for much of the season. With the spell of hot, dry weather late in August, it is turning and corn harvest is beginning or rapidly approaching in many parts of the state. 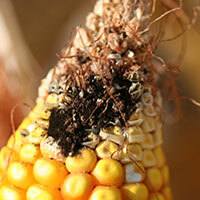 Diplodia ear rot, Penicillium ear rot, Gibb ear rot and Aspergillus species other than Aspergillus flavus are common problems year in and year out but the severity varies with weather conditions at pollination or close to harvest. 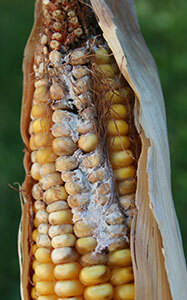 Penicillium ear rot, Gibb ear rot and Aspergillus niger are particularly evident on the exposed tips of ears, around insect tunnels and on ears that have remained upright. If there are periods of wet weather before corn is harvested, some of the corn plants that died prematurely may show the black discoloration caused by secondary fungi coming in on the senescing plant tissues. Temperatures have been unusually cool through much of the season so the likelihood of problems with Aspergillus flavus and aflatoxin is low. 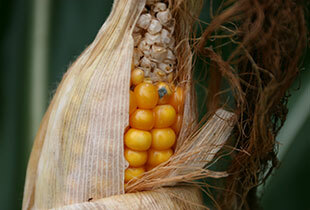 Descriptions of the common ear and kernel rots of corn are given below. 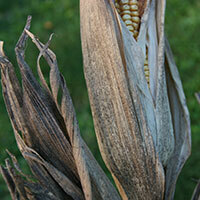 So far the levels of ear and kernel rots appear to be low. This could change if regions of the state move into a pattern with more frequent rains or heavy dews or if harvest is delayed due to wet conditions. 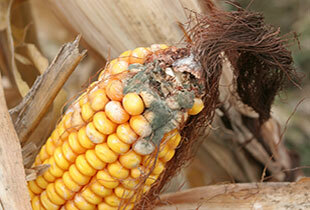 Penicillium ear rot is usually evident as discrete tufts or clumps of a blue-green or gray-green mold erupting through the pericarp of individual kernels or on broken kernels. Penicillium appears as small, discrete colonies of mold growth with a dusty or powdery appearance. The fungus may actually invade the kernel giving the embryo a blue discoloration. Blue-eye is the term used for this blue discoloration of the embryo. 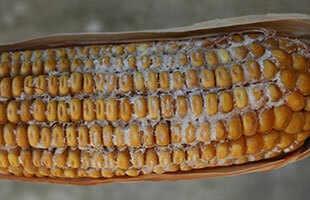 Gibb ear rot (caused by Gibberella zeae) usually begins as a pinkish white mold at the tip of the ear. Early infected ears may rot completely with husks adhering tightly to the ear and a pinkish to reddish mold growing between husks and ears. Although mold growth usually has a pinkish to reddish color, it can appear yellow to yellow-orange to yellow-red or even primarily off-white. Gibb ear rot typically begins at the tip of the ear but under favorable conditions it can move down the ear causing extensive damage. It may also develop around injuries from hail, birds or insects. 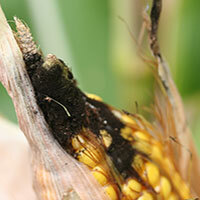 Black corn occurs when any of a number of saprophytic or weakly parasitic fungi grow on corn plants in the field. Alternaria, Cladosporium, Aureobasidium and other species are frequently found on these discolored or black plants. 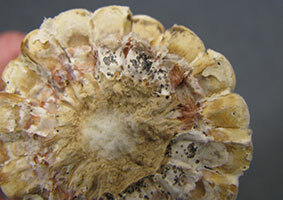 Since the affected plants may have a sooty appearance these fungi are sometimes called sooty molds. 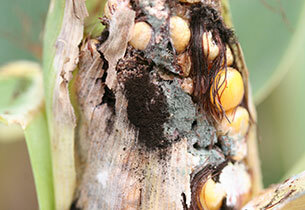 These sooty molds or secondary fungi tend to develop on plants when wet or humid weather occurs as the crop is maturing or if harvest is delayed because of wet weather. Typically these fungi come in on plants that are shaded, undersized, weakened or prematurely ripened and on senescing foliage. Plants that are lodged or that have been stressed by nutrient deficiencies, plant diseases or environmental conditions may be more severely affected. Although many of these fungi produce dark or black mold growth, the color of the mold growth can range for dark or black to olive green or even pink to white. 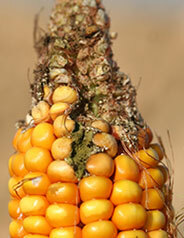 Management of Ear and Kernel Rots: Little can be done to prevent or reduce the invasion of corn by fungi in the field. 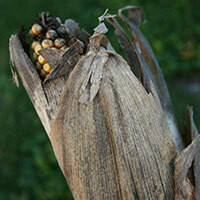 These ear and kernel rots tend to be more severe on ears with insect, bird, hail or other physical damage. 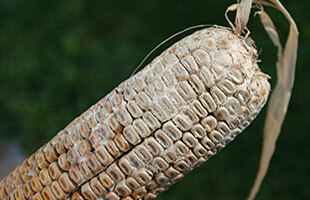 Ears well covered by husks and maturing in a downward position usually have less rot than ears with open husks or ears maturing in an upright position. However, if ear and kernel rots developed in the field, it is important to harvest the field in a timely manner and to store the grain under the best possible conditions. Both Penicillium and Aspergillus can continue to develop on corn in storage if the grain is not stored at proper moisture content and temperatures. These two fungi can cause serious storage mold problems. Stored grain should be monitored on a regular basis during the storage period to be certain storage molds are not developing in the grain mass. This will be especially important of grain stored in temporary storage structures.